Leading walk in bathtub supplier has announced a new frequently asked questions page to their website, which is focused on covering several of the most popular questions about walk in bathtubs and safe bathing products. We hope our improved frequently asked questions page can provide useful answers to the common questions people have when making a walk in bathtub purchase. Aging Safely Baths & More supplies walk in bathtubs and walk in showers to commercial and individual customers throughout the United States and Canada. Their website is both a resource and a means for selecting walk in tubs that conform to space requirements, budgetary concerns and needs, so the new FAQ page helps customers get the detailed information they need fast. 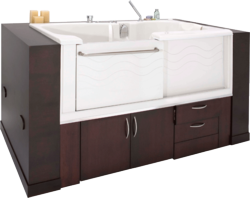 The new FAQ page organizes many of the most popular questions customers have about walk in tubs, hydrotherapy tubs, and walk in showers, so customers can choose a walk in bathroom fixture that has the safe bathing features they want. Even if, customers do not have specific questions, browsing the new FAQ page is the perfect way for customers to educate themselves about aspects of purchasing walk in bathtubs that may not have crossed their minds. The new FAQ page explains necessary installation information that will make customers feel secure that they have the space for a walk in tub, walk in shower or handicap shower. It also advises customers about the installation of walk in tubs and showers. Additionally, the FAQ page recognizes that a customer who wants a walk in hydrotherapy tub may not be familiar with the differences between water massage that is created by air and whirlpool jets. The new FAQ page provides a brief description that makes it easy for customers to choose the massage option that will potentially help reduce inflammation and alleviate their pain most comfortably. Some customers may browse a walk in bathroom fixture’s therapy options and may not realize exactly what the therapy accomplishes. The FAQ page offers easy-to-understand explanations about chromatherapy, hydrotherapy and aromatherapy, so customers know how these options can be of benefit to them by potentially reducing inflammation, or promoting relaxation. The FAQ page provides customers with other resources and an opportunity to request answers to individual questions. The FAQ page suggests contacting a physician to determine whether a walk in hydrotherapy tub, roll in shower, or other walk in bathroom fixture can be prescribed. A list of resources is also available on the page, and several resources provide information for specific medical conditions. A user-friendly “contact us” area allows customers to send Aging Safely their own questions about walk in bathtubs, hydrotherapy tubs, and other fixtures that promote safe bathing for customers with limited mobility.